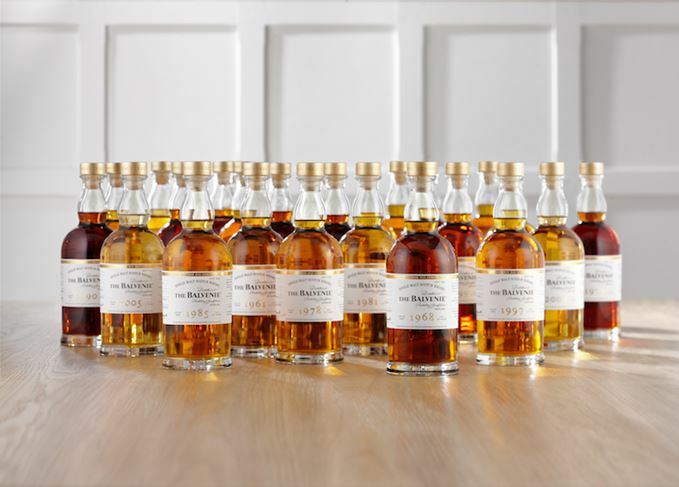 Balvenie has unveiled its ‘biggest launch to date’ in the shape of the DCS Compendium – a five-part collection of 25 whiskies and accompanying book that as a complete set may be worth over £125,000. Five chapters: the complete Balvenie DCS Compendium is a tribute to David Stewart's long career. Created to celebrate the life’s work of malt master David Charles Stewart, the Compendium is split into five ‘Chapters’, each of which features five single cask whiskies from five different decades. A different chapter will be released annually between now and 2019, each of them reflecting a different chapter in the accompanying book, written by Balvenie global brand ambassador Dr Sam Simmons. Chapter One, unveiled this evening (13 October) at the Wallace Collection in London, is valued at £27,000. The subsequent chapters are expected to command similar price tags, featuring liquid distilled from 1961 to 2009. The theme of Chapter One is 'Distillery Style'. Chapters Two to Five will focus respectively on: 'The Influence of Oak', 'Secrets of the Stock Model', 'Expecting the Unexpected' and 'Malt Master's Indulgence'. The oldest bottling in Chapter One is a 1968 whisky matured in a refill American oak hogshead and valued at £19,000. The youngest is a 2005 whisky matured in a refill American oak barrel which, despite being only nine years old, is valued at £400. 'This is about David handing over 53 years of experience and knowledge,' added Simmons. 'This is a celebration, not a funeral and not a retirement party – it's a celebration of a master of his craft. This is not the first time that Balvenie has paid tribute to Stewart's lengthy career as the distillery's malt master: Balvenie Fifty, a 50-year-old single malt, was released in 2012 to mark his five decades at the distillery, and was followed by another 50-year-old release two years later. Chapter One will be available to buy as a set or as individual whiskies, all of which will be presented in walnut and brass presentation frames. 1968: 46 years old, Cask 7293, a refill American oak hogshead, filled 11 June 1968, 45.9% abv, £19,000. ​1978: 37 years old, Cask 2708, a refill American oak barrel, filled 11 March 1978, 50.2% abv, £4,500. 1985: 30 years old, Cask 612, a refill American oak barrel, filled 12 February 1985, 54.1% abv, £1,300. 1997: 17 years old, Cask 5365, a refill American oak barrel, filled 9 June 1997, 60.7% abv, £700. 2005: 9 years old, Cask 6587, a refill American oak barrel, filled 6 May 2005, 57.5% abv, £400. Read Dave Broom's tasting notes on the Balvenie DCS Compendium Chapter One. The new limited release commemorates the 25th anniversary of the DoubleWood 12-year-old. The five whiskies are priced at £57,000, including the distillery’s oldest release to date. The malt master and a pioneer of double cask maturation reflects on his career. Unusual peated expression, aged for 14 years, will be exclusive to travel retail. Balvenie’s apprentice malt master discusses her inspirational mentor and envious friends.